India car tyres blotter from the early 1960s. Homepage. This page: A desk blotter promoting India tyres, a common make of tyre seen on cars until the 1960s. Many of the tyre brands regularly encountered during the 1930s - 1960s have long since disappeared from the market, often due to companies being absorbed into larger concerns. One such make of tyre that has vanished from tyre depots and garages is India, once a common sight on the side of crossplies the length and breadth of the country, but now only to be seen on ancient motor-cars still sporting their original tyres. 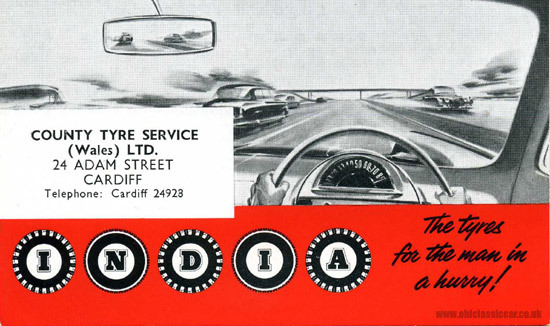 This India Tyres blotter was a freebie given away by the County Tyre Service (Wales) Ltd, of Adam Street in Cardiff. The scene suggests a date in the early 1960s. It shows press-on motorists zooming along a nice new section of motorway, the view uncluttered by speed cameras, and abandoned lorries in adjoining fields with large advertisements draped across them. The car we're riding in is really getting on with it, the driver's grip on the steering wheel keeping the car in-check as it powers along at 80+ mph in the outside lane. Heading in the opposite direction, another motorist on a mission, this time in an XK150. India Tyres - "The tyres for the man in a hurry!" Return to the motoring collectables section of the site. Several other motoring-related blotters are in this section, for example one from John Bull, and another from Dunlop. An old motor engineer's invoice from 1933, featured on this page, also contains advertising for India tyres.